2.1 original brief/purpose Built to replace the 1937 Southern Stand by Purnell and Pearce. 3.2 construction Re-inforced concrete, steel roof structure including trusses, masts and stays. 3.3 context The Register of the National Estate describes the development of the Melbourne Cricket Ground, or MCG as it is usually known. From its beginnings as a simple paddock-like ground with a modest pavilion and with limited grandstand and other facilities scattered around the perimeter, the Melbourne Cricket Ground has evolved and expanded through a process of phased redevelopment and renewal into a major piece of sporting infrastructure serving the metropolitan area and the State as a whole. Currently, the stadium comprises four principal stands, the MCC Members Pavilion (the third on the site, designed by Stephenson and Meldrum and completed in 1927), the Northern (Olympic) Stand (designed by AW Purnell and completed in 1956), the Western (Ponsford) Stand (designed by Tompkins, Shaw & Evans and completed in 1968) and the Great Southern Stand (designed by Daryl Jackson in association with Tompkins Shaw & Evans and completed in 1992), the oval, light towers (1984) and Australian Gallery of Sport (1986). The MCG is of aesthetic significance primarily for its overall form and scale. 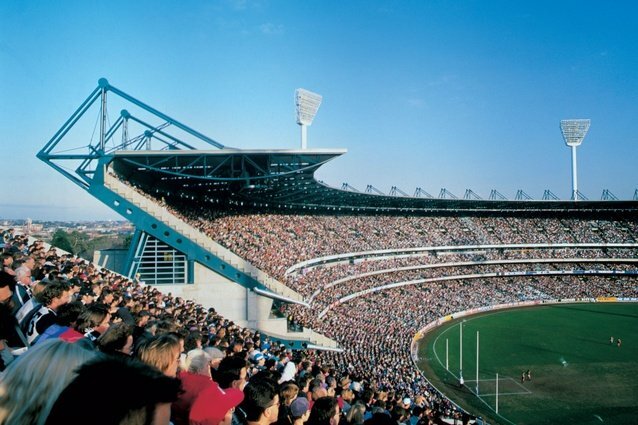 4.5 general assessment The MCG is one of the most well known sporting facilities in Australia and has been used continuously since the nineteenth century.